There are many benefits of living in a senior living community. Some of which are mentioned in the previous articles such as stress free living, decreased boredom, and better food options. There are of course other benefits to living in a community like Hickory Glen. According to APlaceForMom.com other benefits are making new friends, feeling safe and improved family relationships. SeniorLiving.net also states that socialization and “All-Inclusive” rents are other benefits of living in a senior community. 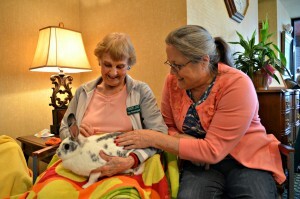 Hickory Glen offers many opportunities to make new friends. We have a greeter program for new residents that help people get acquainted with the community and other residents. Many people are afraid that they will not know anyone when they move in, so we take that worry off your plate! There are many other opportunities to get to know others living here and we have many people from many different walks of life. People are often surprised to find a friend from the past living here. Bob found the person that had picked he and his “girl” up over 60 years ago and took them to St. Louis to get “hitched”…….he hadn’t seen him since the day he dropped he and his bride to be off in St. Louis. There are many of those “feel good” stories here at Hickory Glen, you might be surprised who you find here. Often times it can be a little scary to live by yourself and just the thought that someone else is nearby can be the difference between a sleepless night and restful night. There is 24 hour staff here at Hickory Glen and they are always just a call away. Regular rounds are made in the building to make sure things are secure. It is a comfort to both residents and their families to know a Hickory Glen staff member is so close. Families sometimes worry about a parent or older relative and spend any time they have with them fixing something in the house, mowing the yard, or shopping for them. Steve said “I think you do a wonderful job here (at Hickory Glen), we do not worry so much about mom and can come enjoy a day with just her”. The role reversal of the kids becoming the caregiver of parents can be very stressful on relationships. Let us take some of the worrying off your plate and come simply enjoy a visit with your family member. It will make your parent feel less of a burden and make them feel important again, making for a happier relationship. Decreasing isolation is a large part of living a healthier life, but especially so for our older adults. Older adults can become isolated because they no longer drive, or their friends are no longer able to get out. Living at Hickory Glen provides many opportunities for socializing. Not only do we have activities to participate in, but meals are also taken in our dining room with friends or there is our transportation. We take our bus on small group outings to a variety of places, or to the grocery store. On Sunday’s we take our residents wanting to go to their church. John said about a trip to church on Sunday “Hickory Glen provides wonderful transportation services”. Socializing can be different for everyone: for some it is participating in activities, for others it is simply sitting in a lobby area and watching people. You choose how social you want to be. Come be a part of Hickory Glen’s vibrant community.